If you are looking for my Sparkle Creations Challenge #38 card, please scroll down or click HERE.. Thanks! Hello! Welcome to Day 7 of JustRite Stampers April stamp previews! 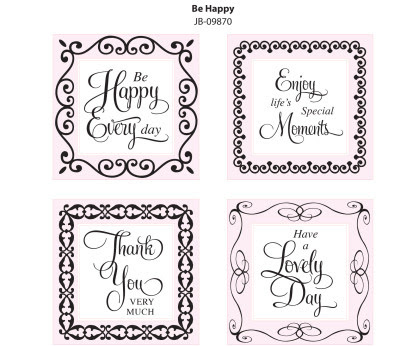 Today we are introducing a new ribbed set, JB-098705 Be Happy Borders & Centers - Interlocking. 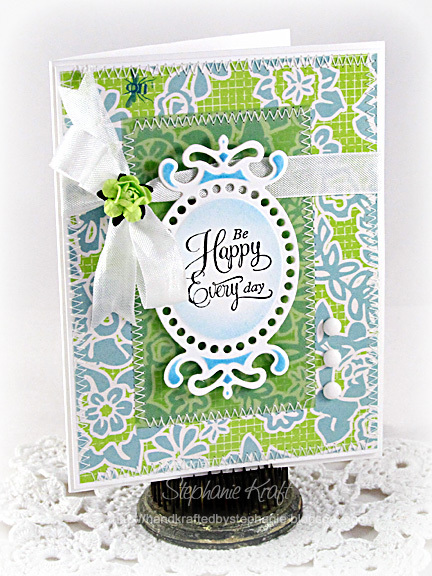 This 2" square set has 4 lovely sentiments that you can use alone or with one of the 4 beautiful borders. I only used a sentiment today.. I also attempted to show you that you can use these sentiments in any way.. not just as a square. I first started with one of the tags from Spellbinders Fancy Tags Three. I cut, embossed and stenciled, then I added a little sponging to the center of tag while it was still inside the die. Next I stamped my sentiment with Memento Tuxedo Black. The tag is popped onto all of my layers with foam tape. I will be back tomorrow with the final JustRite introduction for April.. Thanks so much for stopping by! Accessories: Seam binding, flower, Candy Dots (Pebbles), Foam tape, Thread, Sewing machine. This is SO gorgeous Steph! LOVE these papers and the colors on this!!! This is wonderful Stephanie. I love the patterned backgroud papers you used, and your stitching is always perfect. Stephanie, I LOVE this die (just received it yesterday!) and how you used it. Such a lovely and Spring fresh color combo, too! Such a gorgeous card! I love this color combo. A pretty card - beautiful colors and of course, that saying! Great! So pretty Stephanie! I love how you stenciled the die cut! Really makes the beautiful detail pop! this is a great card stephanie-I like the papers you used and the spellbinders die really accents the sentiment well-then there is your signature sewing-I love it!! Lovely card! The colors are so fresh! Stephanie this is just wonderful!!! Love this beautiful colour combo and LOVE the way you've framed the sentiment!! Beautiful card!!!! You are ROCKING the colored vellum! Love it! The fresh color scheme is fantastic! Well the papers match the sentiment! I love the the bright happy colors and then I read the sentiment and though perfect pairing! Lovely card!